Quality of life studies form an essential part of the evaluation of any treatment. 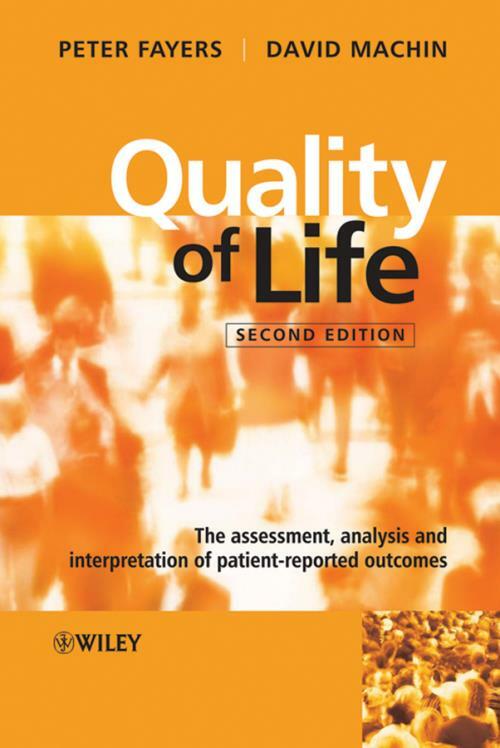 Written by two authors who are well respected within this field, Quality of Life: The Assessment, Analysis and Interpretation of Patient-reported Outcomes, Second Edition lays down guidelines on assessing, analysing and interpreting quality of life data. The new edition of this standard book has been completely revised, updated and expanded to reflect many methodological developments emerged since the publication of the first edition. This book is of interest for everyone involved in quality of life research, and it is applicable to medical and non-medical, statistical and non-statistical readers. It is of particular relevance for clinical and biomedical researchers within both the pharmaceutical industry and practitioners in the fields of cancer and other chronic diseases. 1.2 What is quality of life? 1.4 Why measure quality of life? 1.5 Which clinical trials should assess quality of life? 1.6 How to measure quality of life. 2. Principles of measurement scales. 2.3 Constructs and latent variables. 2.4 Indicator variables and causal variables. 2.5 Single global questions versus multi-item scales. 2.6 Single-item versus multi-item scales. 2.7 Psychometrics and item response theory. 2.8 Psychometric versus clinimetric scales. 2.9 Sufficient causes and necessary causes. 2.10 Discriminative, evaluative and predictive instruments. 2.11 Measuring quality of life: indicator or causal items? Part B. Developing and Testing Questionnaires. 3.3 Defining the target population. 3.9 Face and content validity of the proposed questionnaire. 4. Scores and measurements: validity, reliability, sensitivity. 5.5 Cronbach’s a and internal consistency. 5.6 Implications for causal items. 6. Factor analysis and structural equation modelling. 6.5 Factor analysis of the HADS questionnaire. 6.6 Uses of factor analysis. 6.7 Applying factor analysis: choices and decisions. 6.8 Assumptions for factor analysis. 6.9 Factor analysis in QoL research. 6.10 Limitations of correlation-based analysis. 6.12 Confirmatory factor analysis and structural equation modelling. 6.14 Further reading and software. 7. Item response theory and differential item functioning. 7.2 Item characteristic curves . 7.4 Fitting item response theory models: tips. 7.6 IRT versus traditional and Guttman scales. 7.7 Polytomous item response theory models. 7.9 Quantifying differential item functioning. 7.10 Exploring differential item functioning: tips. 7.12 Further reading and software. 8. Item banks, item listing and computer-adaptive tests. 8.4 Item linking and test equating. 8.7 Stopping rules and simulations. 9. Choosing and scoring questionnaires. 10.4 Administering a quality-of-life assessment. 10.5 Recommendations for writing protocols. 11.2 Significance tests, p-values and power. 11.5 Comparison with a reference population. 11.7 Choice of sample size method. 11.9 Specifying the target difference. 11.10 Sample size estimation is pre-study. Part D. Analysis of QoL Data. 12.6 Analysis of variance models. 13.1 Area under the curve. 14.5 Modelling versus area under the curve. 15.2 Types of missing data. 15.3 Why do missing data matter? 15.5 Methods for missing items within a form. 15.7 Methods for missing forms. 16. Practical and reporting issues. 16.2 The reporting of design issues. 16.4 Elements of good graphics. Part E. Beyond Clinical Trials. 17.8 Prognosis and variation with time. 18.3 Absolute levels and changes over time. 18.6 Minimal clinically important difference. 18.7 Impact of state of quality of life. 18.8 Changes in relation to life events. 18.10 Effect sizes and meta-analysis. 18.12 Number needed to treat. 19.7 Measures of treatment effect. 19.11 Publication bias and funnel plots. [L, flush left]E1 Sickness Impact Profile (SIP). E2 Nottingham Health Profile (NHP). E3 Health Survey Standard Version (SF-36v2). E5 Patient Generated Index (PGI). E6 European Organisation for Research and Treatment of Cancer (EORTC QLQ-C30). E7 EORTC Head and Neck Module (EORTC H&N35). E8 Functional Assessment of Cancer - General version (FACT-G). E9 Rotterdam Symptom Checklist (RSCL). E10 Quality of Life in Epilepsy (QOLIE-89). E11 Paediatric Asthma Quality of Life Questionnaire (PAQLQ). E12 Hospital Anxiety and Depression Scale (HADS). E13 Short Form McGill Pain Questionnaire (SF-MPQ). E14 Multidimensional Fatigue Inventory (MFI-20). E15 Barthel Index of disability (modified) (BI). T2 Normal distribution - percentage points.